To view the Directional Movement Indicator (DMI) select Wilder's DMI from the Indicator Menu. This will calculate the directional movement indicators and plot them at the bottom of your screen. This is a type of oscillator to give you buy and sell signals on individual issues. 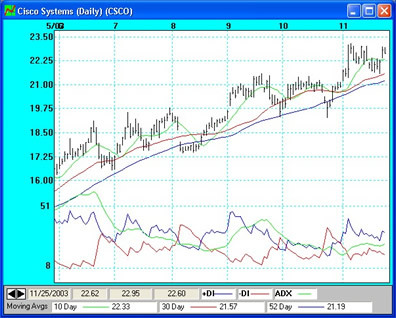 There are three lines plotted for this indicator: +DI, -DI and the ADX. What you want to find is a stock that makes regular swings of price from high to low and has a fair amount of time to ride the directional movements of the price, so that you profit from the price action. Bullish Signals - When the +DI crosses above the -DI and the ADX is turning from either a peak or valley. Bearish Signals - When the -DI crosses above the +DI and the ADX is turning from either a peak or valley. If you are not already familiar with this indicator, it is important to watch this indicator before committing any funds to this method of investing.